On the 28th January, Heads of state, business and religious leaders are meeting in the Swiss alpine town of Davos to initiate the start of the five day World Economic Forum (WEF). The WEF is a Geneva-based non-profit foundation best known for its Annual Meeting in Davos, Switzerland which brings together top business leaders, international political leaders, selected intellectuals and journalists to discuss the most pressing issues facing the world including health and the environment. In 2008, some 250 public figures attended the Annual Meeting, including: Ban Ki-moon, Condoleezza Rice, Ferenc Gyurcsany, François Fillon, Gloria Macapagal Arroyo, Gordon Brown, Hamid Karzai, Queen Rania of Jordan, Shimon Peres. 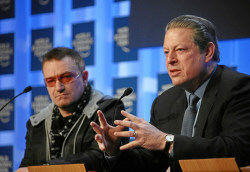 Al Gore, Bill Clinton, Bill Gates, Bono, and Tony Blair are also regular Davos attendees. Past attendees include: Angela Merkel, Dmitry Medvedev, Henry Kissinger, Nelson Mandela, Raymond Barre and Yasser Arafat. Since 2000, the Forum has been promoting models developed by the world’s leading social entrepreneurs in close collaboration with the Schwab Foundation for Social Entrepreneurship. The Foundation highlights social entrepreneurship as a key element to advance societies and address social problems. With the world heading towards financial meltdown, renewed conflict in the Middle East, U.S. President Barack Obama’s new White House administration and environmental issues are likely to be some of the topics at the top of this year’s agenda. As part of this year’s “Dear Davos” coverage, news channel CNN is inviting a selection of influential bloggers to submit their questions to be put to Davos attendees during their daily coverage from the forum. CNN will be there to cover the event, and they’ve given us the opportunity to put a question directly to business leaders taking part in the summit. Please share your suggestions with us by leaving them as a reply to this post. Next story Ethical Soup-er Store Finale!